PPSC Notification is out. 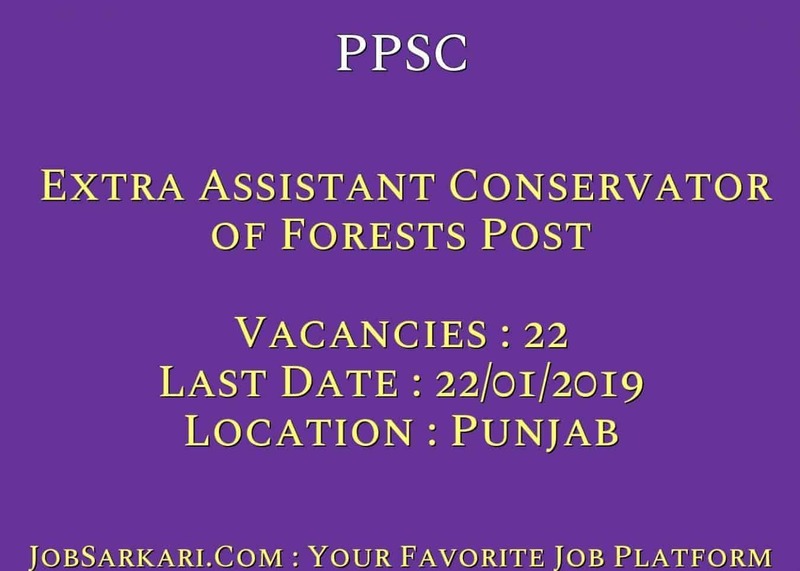 PPSC is recruiting for 22 Extra Assistant Conservator of Forests Post Posts. You can check PPSC - Punjab Public Service Commission last date, download PPSC notification, visit PPSC official website and check other PPSC Vacancy details.Complete Vacancy and recruitment Details about 22 Extra Assistant Conservator of Forests Post vacancies in PPSC are provided below by JobSarkari.Com only for you. Last Date for Apply Online 22/01/2019. Last Date for Payment of Application Fee 28/01/2019. Assistant Conservator of Forests Candidate Must Have Passed Graduation With Minimum 45% Marks in Natural Sciences, Geology, Mechanical Engineering, Civil Engineering, Chemical Engineering, Agriculture and Master Degree in Mathematics, Statistics or Economics, Natural Sciences, Geology, Mechanical Engineering, Civil Engineering,Chemical Engineering,Agriculture . 22. 6.Online Application Can be Submitted on or before 22nd January 2019. Q. What is the Last Date For PPSC Extra Assistant Conservator of Forests Post Vacancy ? A. 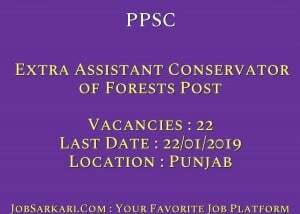 Last Date for PPSC Extra Assistant Conservator of Forests Post Posts is 22/01/2019. Q. What is the Form Type of PPSC Extra Assistant Conservator of Forests Post Recruitment ? A. The Form Type for PPSC Extra Assistant Conservator of Forests Post Posts is Online. Q. 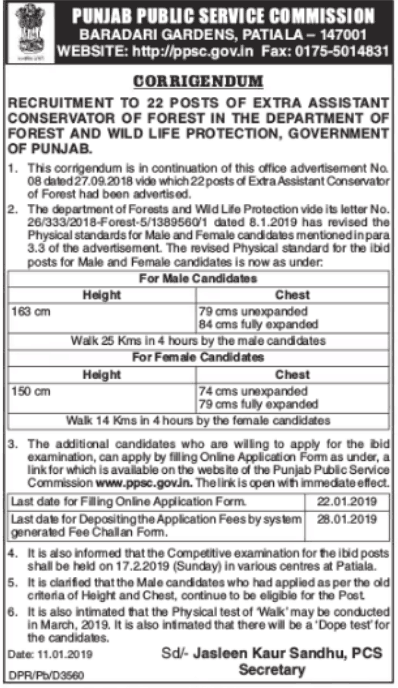 How many vacancies are available in Punjab Public Service Commission Extra Assistant Conservator of Forests Post Posts ? A. There are about 20 Vacancies in Punjab Public Service Commission Extra Assistant Conservator of Forests Post Posts. Q. What is the Full Form of PPSC ? A. Full Form of PPSC is Punjab Public Service Commission .